A good night’s sleep. For many people, it’s an El Dorado; a tantalizing and strived after fable that is ultimately as distant and unattainable as any fairy tale ending. And with official reports indicating that as many as 1 in 3 Americans suffers from insufficient sleep, the problem’s not simply one to be casually dismissed. It may seem no big deal to lose an hour or two of sleep a week; but as stress and anxiety in our day to day lives tend to mount each passing week, those lost hours can lead to chronic insomnia. Which has far graver consequences than waking up feeling less than bright eyed and bushy tailed. Weighted blankets are a natural and innovative way scientifically engineered to reduce chronic sleep discomfort and relieve stress. They are by no means a substitute from physician recommended therapies but should be considered in tandem to promote optimal sleep. Below, we’ll list some of the top brands on the market, as well as a quick guide to what to look for in deciding on one. One of the most versatile sized weightless blankets on the market, with three weight sizes to choose from between 15 and 25 lbs. 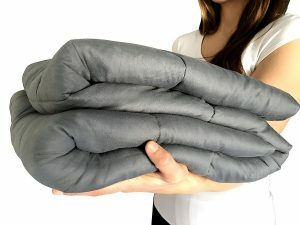 With a removable duvet cover, this blanket is one of the more innovative products we’ve seen; developed by a practicing neurologist, the blanket utilizes quartz micro-spheres to apply deep touch pressure stimulation, while the stitching contains organically shaped patterns designed to contour to your body. Eco-friendly and comfortable enough for two, this blanket fits both king, queen, full and twin sized beds. Made from 100% cotton with reinforced stitching and highly durable, this blanket is hypoallergenic, washable and also serves multiple purposes; in addition to a stress reliever, it’s been found to be an excellent aid for children with Autism and ADD. With a subtle, slate gray color and a lighter weight than many other blankets, this product is ideal for petite adults and well as children. Note, however, the duvet cover is not included. This helps promote a single posture (a clinically suggested method to fall asleep quicker) as opposed to tossing and turning to find an adequate one. The material is thinner than many other blankets available, but still entirely durable and washable. Featuring Deep Pressure Touch stimulation (which helps serve to boost melatonin levels), this is a perfect all season blanket; its ultra plush, premium cotton fabric is equally comfortable both during winter and summer seasons. Double stitching helps ensure the fill pellets stay secure, and the choice of three sizes allows each individual to choose a size most appropriate for their own personal needs. A 90-day money back guarantee makes this an excellent choice for first-time buyers, as well. 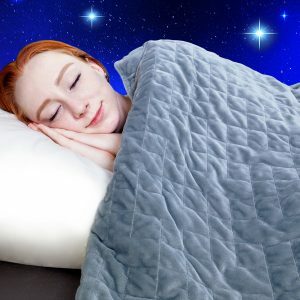 Weighted Blanket Buying Guide – How to find the best weighted blanket for your needs! Generally speaking, there’s numerous factors to take into consideration when purchasing a weighted blanket. Given that their popularity is a relatively recent phenomenon, there’s no general rule to follow. But below are some of the more common traits to consider when shopping. Although most manufacturers offer multiple sizes – with some models weighing as little as 5 lbs and others reaching up to 25 – a good rule of thumb to keep in mind is that the blanket should weigh approximately 10% of your personal body weight, plus a few pounds. A 10 lb blanket should suit an 80 lb child, while a 17 lb blanket should be sufficient for a 150 lb adult. The question of comfort comes up frequently, particularly in the summer. Most users indicate that they haven’t felt a drastic increase in heat as a result, but since body temperatures vary its best to shop around and read reviews. It’s ultimately a matter of personal preference and need. While many brands use 100% cotton, you might prefer a more plush material; and if you suffer from sensory issues, the fabric can often aid the experience or hinder it. Even distribution of weight is a tricky issue, especially if the material used in the filling consist of granular sand or barley. Many brands tend to use poly-pellets or small beads; but even this is not a surefire solution. In general, look for reinforced stitching and smaller squares and patterns, as this will help ensure a consistent weight throughout. While weighted blankets have been proven to assist individuals with conditions as varied as Anxiety, Restless Leg Syndrome, Fybromalgia, ADD and Autism, they should not be taken as substitutes for traditional therapies. If you’re suffering from chronic pain or severe sensory issues, a weighted blanket is not an alternative but a potential adjunct. Consult with a physician prior as to whether or not your usage will prove beneficial.